The over 500 year old city Phitsanulok located on the banks of Nan River, approximately 390 km from Bangkok. Today there are only a few ruins remaining of the city's big days. 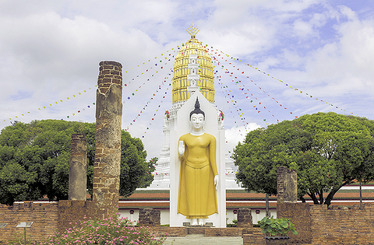 A large fire destroyed the old district of the city in 1960 Wat Mahathat with the famous Buddha figure, however, remain as a memory of the past. Go for a walk along the river, with the floating houses and shops located in the shade and flowering trees. Here you can follow the trade but also see the loading and unloading of all boats that come to the city with goods and more. Keep in mind that in some places where there is not so many tourists you can only exchange money during banks' regular hours. Wat Sri Ratana Mahathat Phran is the city's main monuments, the temple is located to the left of the bridge with the main entrance towards the river. With this placement the temple remained untouched during the great fire in 1960 The gilded Phrangen goes in Khmer style. The main doors of the building is from 1700 and is decorated with marble on a black ground. When you have passed the doors you will pass a large hall with Buddha figures in Sukhothai and Chiang style. Inside the temple the famous Buddha is who is made in bronze whose name is Phra Buddha Chinarat in Sukhothaistyle this Buddha is the finest in this particular style. At Nanriver there is a market, a good place if you want to make cheap purchases. Here you bargain on prices. In the market you can buy handicrafts and cheap food. You can fly domestic flights to Phitsanulok more times per day from Bangkok. Flights from Chiang Mai is also possible.